Taco ’bout a delicious hobby. 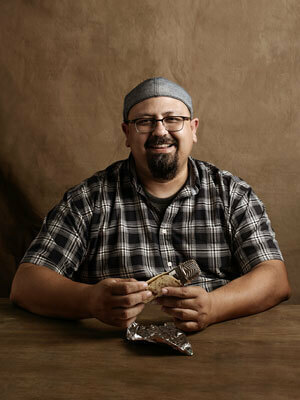 Eddie Vega, a self-proclaimed taco aficionado, is often on the hunt for Texas’ best tacos. When he’s not doing that, Vega can be found performing poetry at open mic nights around San Antonio. Vega (B.A. ’99) has been a published and performing poet since 2010. His poems about tacos and his taco blog — We Taco Bout It — have earned him enough local recognition that he was selected to serve on the Texas Taco Council as one of two taco ambassadors for the San Antonio area. The Texas Taco Council is made up of Vega and 19 other Taco Ambassadors representing 10 Texas cities, who were selected by a group of taco journalists for their taco knowledge. The small group of journalists formed the council to create their book, The Tacos of Texas, which relied on the Taco Ambassadors’ top taco picks and taco culture in their respective cities to produce a comprehensive guidebook to the best tacos in Texas. But Vega isn’t all tortillas and fillings. His poetry also focuses on his passion for social justice and Tejano culture, which helped the San Antonio Puro Slam regional team win third place at a competition in Denver last year. The topic of social justice in his poetry is inspired by the teachings from his Theology degree and his St. Mary’s service immersion trip to Mexico, which led him to live with Marianists in Veracruz for 10 months after graduation. Vega teaches theology “from a social justice perspective” at Incarnate Word High School, while also working at Gemini Ink as a writer-in-community and as a mentor for aspiring writers in the community. In 2013, Vega was a mentee for Gemini Ink under former Texas Poet Laureate Carmen Tafolla. Vega performs slam poetry regularly in San Antonio, hosts open mic nights and the St. Mary’s Young Alumni Trivia Night, as well as contributes to his blog, which he writes with fellow St. Mary’s alumnus Teno Villarreal (B.A. ’01).